This Classic Zucchini Bread is the BEST zucchini bread recipe! 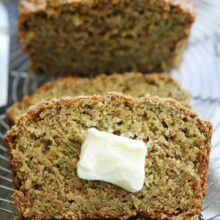 It is easy to make, perfectly spiced, and the zucchini bread is super moist! The best way to use up your garden zucchini. Yay for Zucchini Recipes, Especially Zucchini Bread! You guys know I am OBSESSED with zucchini. 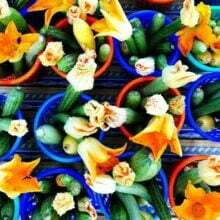 I love the green vegetable and I LOVE creating zucchini recipes. Have you seen our collection of over 35 zucchini recipes? There are sweet and savory recipes, something for everyone. I love all of these zucchini recipes and try to make them every summer when the garden zucchini is out of control. Sometimes, I don’t get to them all but every year I ALWAYS make classic zucchini bread. Today, I am going to share my tips for making the BEST zucchini bread recipe. 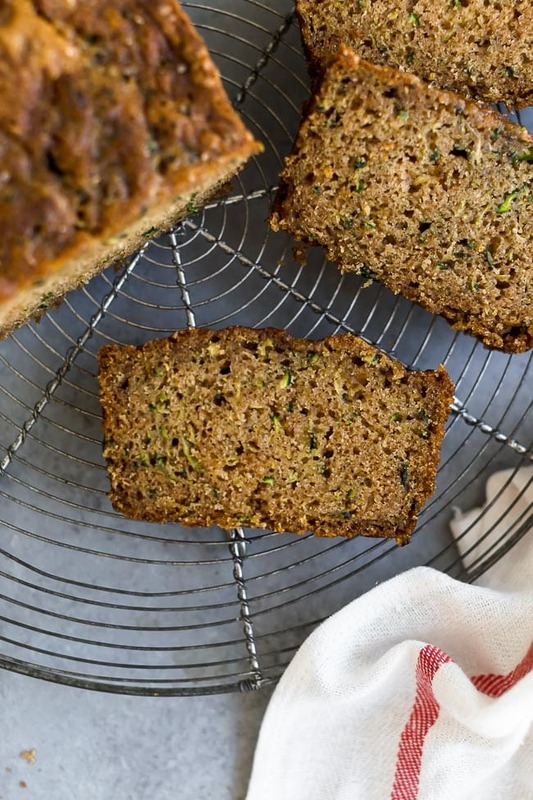 This will be your favorite zucchini bread recipe from now on! 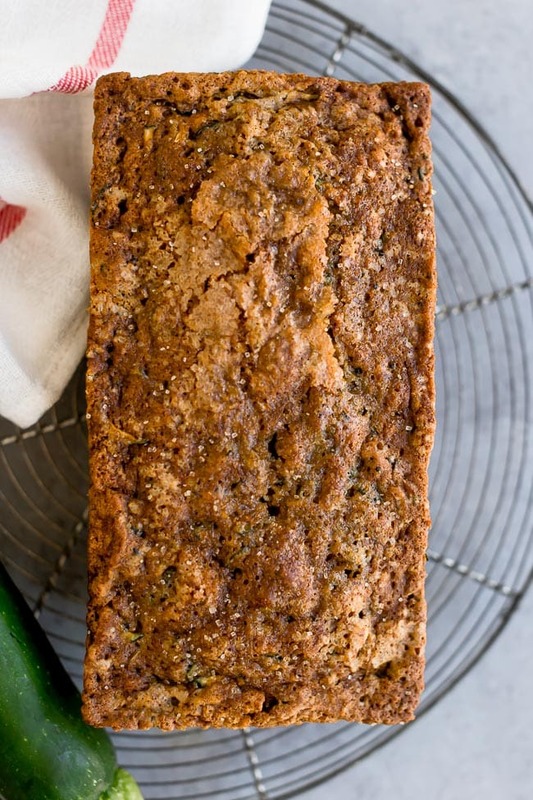 This zucchini bread is perfectly moist and has the best flavor thanks to the spices. I like to add cinnamon, nutmeg, ginger, and a little bit of ground cloves. I also make the bread with melted butter and oil. I love the combo. The butter gives the bread great flavor and the oil makes the bread super moist. I use mostly brown sugar because I love the deep caramel molasses flavor. I still add a little granulated sugar to balance out the texture and sweetness. Vanilla extract is a must, go for two teaspoons, you will be glad you did! Before the bread goes into the oven, I like to sprinkle it with a little turbinado sugar. This will give the bread a nice sugary crunch on top! Now to answer some common zucchini bread questions and some tips. I want you guys to succeed in your zucchini bread making adventures! I promise this recipe is easy! You will love it! What Size Zucchini Do You Use for Zucchini Bread? You really can use any size of zucchini to make zucchini bread; small, medium, or large. You need 2 cups of grated zucchini for the recipe, so you will need about 3 small zucchini, 2 medium zucchini, or 1 large zucchini. 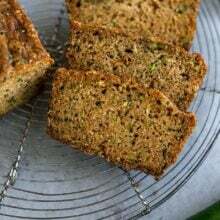 Most people like to use large, overgrown zucchini from their garden to make zucchini bread because they aren’t as good to cook with but are great for baking and making zucchini bread. Never throw these big guys away, they are perfect for zucchini bread! Do You Have to Peel the Zucchini? No! I always leave the green zucchini skin on. Just grate the zucchini with a cheese grater or food processor. Do you Have to Squeeze Out the Liquid in the Zucchini? Yes! Zucchini has a lot of moisture so after you grate it, squeeze some of the moisture out. You can put the zucchini in a clean linen-free kitchen towel or in paper towels and squeeze. You can also put the zucchini in a colander and let the moisture drain out for about 15 minutes. The amount of moisture in the zucchini will vary, depending on the size. I have also found that zucchini from the garden has more moisture than store bought zucchini, especially the big ones. You do want to leave some of the moisture so your bread will be moist, but just get rid of the excess and you will be ready to bake! Can You Freeze Grated Zucchini? Yes! If you can’t use up all of your zucchini, put some in the freezer for later. Put grated zucchini in freezer bags and freeze for up to 2 months. I like to put 2 cups of grated zucchini in a bag so I know it is the amount I need to make this zucchini bread. Label your bags with what it is, the amount, and date. When ready to use, defrost, and squeeze out the extra moisture. There will be more moisture because the zucchini was frozen. You can use frozen zucchini to make other things like cookies, brownies, or pancakes. What Size Pan Do You Use to Make Zucchini Bread? For this recipe, I use a 8 x 4 x 2 1/2 inch loaf pan. I also use a loaf pan that is lighter in color so the zucchini bread doesn’t brown too quickly. If you have a 9 x 5-inch loaf pan you can use it, your zucchini bread will just be a little shorter in size, but still tasty! You can also use mini loaf pans if you want to share little loaves with friends! Make sure you reduce the baking time to about 30 to 35 minutes. Can you make zucchini muffins with this recipe? Yes! Line a muffin pan with paper liners or grease the cups. Fill and bake for 18-22 minutes. Can I use Gluten-Free Flour in This Recipe? Yes, use the same amount of gluten-free all purpose flour. I like Cup4Cup or Bob’s Red Mill All-Purpose Gluten Free Flour. Can I add mix ins? Yes! Feel free to stir in up to 1 cup of chocolate chips, chopped walnuts, chopped pecans, raisins, or dried cranberries. You don’t need a stand mixer or hand mixer to make this recipe, it is so easy! You don’t want to over mix the batter or your bread will sink in the middle. Add the dry ingredients to the wet ingredients and stir until just combined. What if My Zucchini Bread is Getting Too Dark But It’s Not Done in the Middle? If you inserted a toothpick in the center and it doesn’t come out clean, but your bread is getting too dark on top, you can loosely cover the bread with a piece of aluminum foil and keep baking. This will prevent the top from getting overdone and allow the middle to finish baking. I know, it is always SO hard to wait to slice into that wonderful smelling baked bread after it comes out of the oven, but try so the bread can set up. Let the bread cool in the pan for 10 minutes and then remove and let it cool completely on a wire cooling rack. Slice with a bread knife or sharp knife. Yes! Zucchini bread freezes beautifully. Let the loaf cool completely. Once cooled, wrap in plastic wrap and place in a freezer bag or wrap in aluminum foil. Label and date the bread and freeze for up to 2 months. Defrost before slicing. 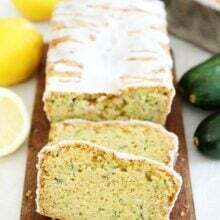 Zucchini bread in the summertime is a MUST, put your garden zucchini to good use and make a loaf today! You will be glad you did, this is the BEST classic zucchini bread recipe! 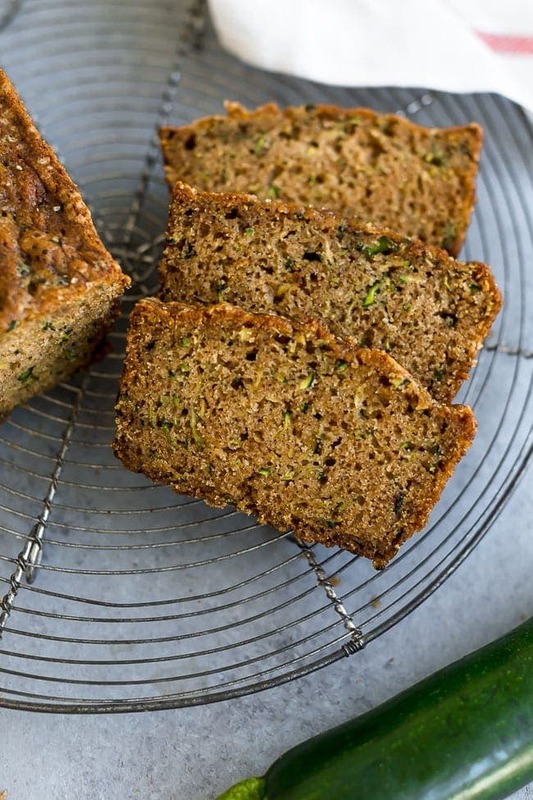 Use your garden zucchini to make a loaf of classic zucchini bread. This recipe is the BEST zucchini bread recipe! It will be your go to every summer! Preheat the oven to 35o degrees F. Grease a loaf pan (8 x 4 x 2 1/2-inch) with nonstick cooking spray and set aside. In a clean linen-free kitchen towel or paper towels, squeeze out the excess water in the shredded zucchini. Set aside. In a medium bowl, whisk together the flour, baking soda, cinnamon, salt, nutmeg, ginger, and cloves. Set aside. In a large bowl, combine the melted butter, oil, brown sugar, granulated sugar, egg, and vanilla. Stir until smooth. Stir in the grated zucchini. Add the dry ingredients to the wet ingredients and stir until just combined. Don't over mix. Pour the batter into the prepared loaf pan. Sprinkle turbinado sugar evenly over the batter, if using. Bake for 50-60 minutes or until a toothpick inserted into the center comes out clean. Remove from the oven and let the bread cool in the pan for 10 minutes. Carefully remove the bread from the pan and cool completely on a wire rack before slicing. Note-the bread will keep on the counter, wrapped in plastic wrap, for up to 3 days. This bread also freezes well. To freeze, cool the bread completely and wrap in plastic wrap and place in a freezer bag. Freeze for up to 1 month. Defrost before slicing. I completely agree about the brown sugar. Sometimes if a bread recipe calls for all white, I’ll sub half brown. I just like the flavor. I love sneaking that zucchini in where I can too. I have a Zucchini Beef Enchiladas recipe that does the same thing! Yum-that bersion does really look good. I always buy dark brown because I love the stuff so much. Your little birthday nieces is so cute and your Alaska trip looks amazing. I love your dress in the one legged pic. I didn’t even notice the lack of leg since I was admiring your dress. That's a lot of cabbage! I need to retry baking with zucchini. Last time I tried baking a batch of zucchini brownies that did not go over well with my husband. I was trying to be sneaky! I love brown sugar as well & think it keeps everything nice and moist. I was going to make zucchini bread this week – and I was looking for a new recipe to try! I had one zucchini that I picked last week. I made a loaf of bread, and it only used 1/3 of the zucchini!! Yummy! It looks like it has a wonderful texture! this looks great. i agree that everything is better w/brown sugar instead of white! I’m so excited about this. My neighbor just gave me one big zucchini. I can’t wait to try out this recipe!!!! Zucchini bread is always a winner, although I had to convince my cw's that it didn't taste like zucchini 🙂 I'm a fan of brown sugar over white any day too – things just seem moister with it. I’d like to see nutritional values in your posted recipes. Please consider adding that into the mix. It’s so important. Hi! 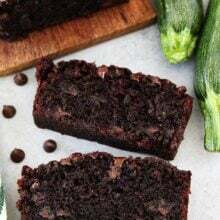 We just made your chocolate zucchini bread yesterday with our giant zucchini from the Farmer’s Market (my 12 yo specifically requested YOUR recipe). Was amazing, I will have to add this to the list to make next. Wanted to share a tip I found for removing the liquid – I use my potato ricer to squeeze excess liquid from shreddded zucchini. It works perfectly – nice to have another use for a single-use kitchen gadget. Such a great excuse to get some extra zucchinis! I didn’t really believe this would be the BEST Zucchini Bread but was hopeful it would be good. Wow, was I wrong. It really is the BEST most moist zucchini bread I’ve ever made (and I’ve made plenty). Thank you. Will be my go-to recipe. I am SO happy you think it is the best too! It is our favorite! Thanks for letting us know! Fantastic recipe! This will be my second time making it this week!